If you’re after a different kind of lottery than the standard OzLotto or Powerball, a secure lottery site might just be the ticket. You need to stick to a secure site and finding one which isn’t run by Tatts can be difficult. Jackpot.com is a regulated secure lottery site, but there’s a few issues which may prevent you from playing here. The site offers an array of lotteries from around the world – so you don’t have to wait for Monday or Saturday lotteries – and guaranteed payouts secured by third party regulation. But these payouts see a 35% retainer which we will detail in depth below, and you can only play in EUR and GBP. Note: This page is intended for our international readers only. Online gambling is illegal in Australia as of September 2017 following the introduction of the Interactive Gambling Amendment Bill 2016, so the content on this page is informational in nature only. 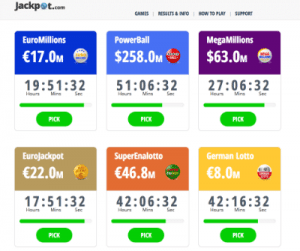 Rather than heading to a newsagent to purchase a lottery ticket, players can head online and bet on the outcome of the biggest lotteries in the world at Jackpot.com. The site is operated in the UK by Lottomatrix Ltd and aims to offer superb customer support, quick payouts and top online lottery draws. These draws are from the world’s top lotteries including US Powerball, US MegaMillions, EuroMillions, EuroJackpot, and German Lotto. This applies for the MegaMillions and PowerBall lotteries and is on top of any taxes required to pay. What it means is if you win, you will only get 65% of the jackpot for these two lotteries. We have a big issue with this, but you can stick to the other lotteries on offer at Jackpot.com if you do, too. Is it legal to play at Jackpot.com? Australian players are subjected to the Interactive Gaming Act (IGA) 2001, which was amended in March 2017 to clarify that online gambling would no longer be tolerated unless the vendor has official licensing from an Australian state or territory. As of September 2017, the Interactive Gambling Amendment Bill 2016 has made online gambling illegal, so Australians cannot play at Jackpot.com. UK players are the main target market for the site and Jackpot.com is legally playable for United Kingdom residents. If you have an issue you can easily contact the site via their customer support options, detailed below, and if your issue isn’t resolved you can contact the UK Gambling Commission. This regulator is considered to be one of the best in the world and will step in and resolve the issue for you if required. You need to have a real money account with the lottery website if you wish to gamble on the outcome of the lotteries. While the site never purchases tickets in the lottery you are still paying for the outcome and if you win, they pay you the prize on offer – for most lotteries. To open an account click on the ‘Sign Up’ link and register your details. You will need to pick between EUR or GPB and you can choose your daily deposit limit from a minimum of £/€50 to a maximum of £/€50,000. Once you have an account you can fund it – see below – and get playing. There are a number of lotteries all around the world for players to opt in for, but remember there is a 35% retainer on winnings from the first two lotteries listed below. We’ve all seen the huge number the US Powerball can get to – up to $1 billion – and now you can be a part of it by matching six numbers. There’s nine prize pools and a huge jackpot – just remember even if you win here you will only receive 65% of the prize, but this could still be a lot. This is another American lottery which takes place twice a week. The jackpot regularly gets up into the nine digit range – the 35% retainer applies here too however. The biggest lottery in Europe is EuroMillions and it often gets to over €190 million. What’s more there’s no retainer on this lottery and you will be paid the prize in full. This is a fairly recent lottery addition in Europe with a jackpot prize pool starting at €10 million. All you need to do to win a prize is match two main numbers and one bonus number, with five main numbers and two bonus numbers scoring you the main prize, which is paid in full by Jackpot.com. This lottery is based specifically in the European country of Italy. It takes place three times a week and offers uncapped jackpots and amazing odds – just 1 in 21 to win – plus the prizes are paid in full. Based in another European country, this German lottery has been running since 1955. It takes place twice a week and often gets to the eight figure mark. All prizes are paid in full. To play, pick a lottery and select your numbers to be in the running to win. You can opt for multiple draws too. Once the lotteries take place the entries are checked and any winnings are paid to your account. You can also keep an eye on the results via the results page. It is important to note, the terms and conditions state the site has full power on how it pays you if you win – they can pay you in full in one go or over multiple consecutive sums. Funding your account to purchase entries for these lotteries is simple. You won’t be charged a fee by the lottery site for depositing but you will incur a conversion fee since you have to play in EUR or GPB. These methods are also available for withdrawals. The site offers a live chat service which is available most of the day – and very helpful to those who enjoy lottery wagers at night. There’s also email support available – just email [email protected] with any issues and a response will be returned within 24 hours. 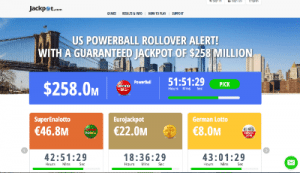 There’s a lot of potential with this site – for international players to participate in worldwide lotteries with the chance to win the prizes is quite exciting. However, the 35% retainer on two of the biggest lotteries available is a huge let down. Additionally, the fact that Jackpot.com can choose how to pay out the prices – lump sum or annuity – means you might not get your winnings immediately. Ultimately the choice comes down to you as the site is secure – thanks to their proven regulation from the UK Gambling Commission.